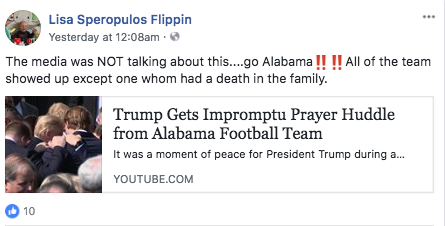 Alabama Football Team Visits White House, Prays for Trump-Truth! - Truth or Fiction? Alabama Football Team Visits White House, Prays for Trump-Mostly Truth! After winning the college football national championship, the Alabama football team visited the White House and included President Trump in a prayer huddle. The University of Alabama football team visited the White House and included President Trump in a prayer huddle. But claims that the media didn’t cover the team’s White House visit — signaling media bias or negativity — are false. After winning the NBA title, the Golden State Warriors declined a customary visit to the White House, prompting the White House to withdraw its invitation. Likewise, the Philadelphia Eagles weren’t invited to the White House after winning the Super Bowl amid rumors that numerous players would decline the invitation. So, after the Alabama football team visited the White House, rumors spread that the media had ignored the visit to fuel the narrative that sports figures dislike Trump. That’s not true, however. Alabama’s visit was covered by the Washington Post, USA Today, and other media outlets across the country. The media wasn’t covering the story when the rumor went viral in May 2018 because the story was more than a month old. Alabama’s football team visited the White House and prayed with President Trump. But, contrary to reports, the event was covered by the media. 'Smallville' Star Allison Mack Trafficked Children to Clintons, Rothschilds-Fiction!